Fam is all new this Thursday January 31st with it’s 5th episode titled ‘Jolene, Jolene’ I have added Episode Stills to the gallery along with stills for the 6th episode ‘Pregnant Pause’ which will air on February 14th. “Jolene, Jolene” – After Clem and Nick tell Shannon she can’t go to a music festival on a school night, Shannon’s long-absent mother, Jolene (Kate Walsh), comes back into her life and tries to undermine them. 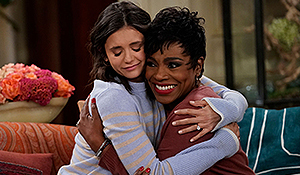 Also, Freddy attempts to help matters in an effort to get back in Clem’s good graces before the wedding, on FAM, Thursday, Jan. 31 (9:30-10:00 PM, ET/PT) on the CBS Television Network. “Pregnant Pause” – Irritated that Clem has been invading her privacy, Shannon plays a prank on her that ends up having far-reaching ramifications, on FAM, Thursday, Feb. 14 (9:30-10:00 PM, ET/PT) on the CBS Television Network.